The ultimate real-time strategy game jumps off the screen and onto your tabletop! The best game that Eagle Games makes. It is a bridge between Euro-economy-builder and American-war, and satisfies on both counts. The minis are incredible and the play is deep with dozens of different strategies. Plays with three players better than any game I have, including Wyatt Earp. Nice components, detailed miniatures and a good game play mechanic which happens to work much like Puerto Rico. However, don't play it with Puerto Rico in mind, this is a different game. Great production value, this game is full of great looking bits. 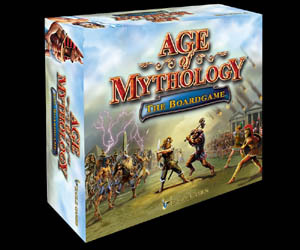 At it's core this is a civ light game, if you can get past the somewhat slow combat mechanic this is a fun game. This is a great hybrid, serves its license well (in terms of a civ-building real-time strategy game), is pretty thematic, has screw-your-neighbor and military aspects, different paths to victory...I really dig this game. Heavily underrated. This game is worth getting for the components alone - you get about 300 (!) small but nicely sculptured miniatures based on mythology. The game itself is a grand strategy game with various routes to victory and simple but sufficient rules. It looks amazing when setup due to all the minis. Great game that can be beaten with a variety of strategies, allowing everyone to have their preferential/unique play style.